UFC 217 is in the books, and what was billed as the UFC’s top blockbuster card of the year turned out to be just that. From top to bottom, UFC 217 exceeded expectations, and from an entertainment point of view proved to be one of the best shows the company has ever put on. There were numerous title changes, massive upsets, highlight-reel finishes, and even some controversy, as the UFC’s second show at Madison Square Garden in New York City lived up to the hype and then some. The main event of UFC 217 was one of the most exciting moments in some time, as Georges St-Pierre made a triumphant return to MMA, submitting Michael Bisping in the third round with a rear-naked choke. GSP looked better than ever after four years off and stepping up a weight class, and he is now the fourth multi-division champ in UFC history. UFC President Dana White says a date against Robert Whittaker, the interim champ, is next, but who knows what GSP’s plans are. As for Bisping, this loss sets him back, but he said he would not retire and plans to fight again. Another stunner came in the co-main event, as TJ Dillashaw finished ex-teammate Cody Garbrandt to claim the bantamweight title. Garbrandt looked great in the first round, nearly finishing Dillashaw at the end, but the second round was a completely different fight, as Dillashaw caught Garbrandt and KO’d him. Dillashaw is aiming for a superfight against Demetrious Johnson next, and White says he likes the idea, so stay tuned. While some are saying Garbrandt deserves a rematch, the fact that he made no title defenses says otherwise. One of the most shocking upsets of the year came courtesy of Rose Namajunas, who brutally knocked out Joanna Jedrzejczyk to win the women’s strawweight title. Most assumed Jedrzejczyk was the better striker, but Namajunas was faster and landed the harder strikes in this fight. It was shocking how one-sided this fight was, but with Jedrzejczyk having so many title defenses before this, perhaps a rematch could be in order. Stephen Thompson kept his place as a top-three welterweight with a clear decision win over Jorge Masvidal. Wonderboy didn’t get the finish but overall it was one of his better performances inside the Octagon as he picked Masvidal apart and likely earned himself a #1 contender’s bout in his next fight. The middleweight division has a new prospect, as Paulo Costa emerged as a star with a TKO win over Johny Hendricks. Costa is now 3-0 in the UFC with three brutal knockouts and has star potential due to his look and fighting style. A fight against a ranked opponent like Tim Boetsch makes a lot of sense. 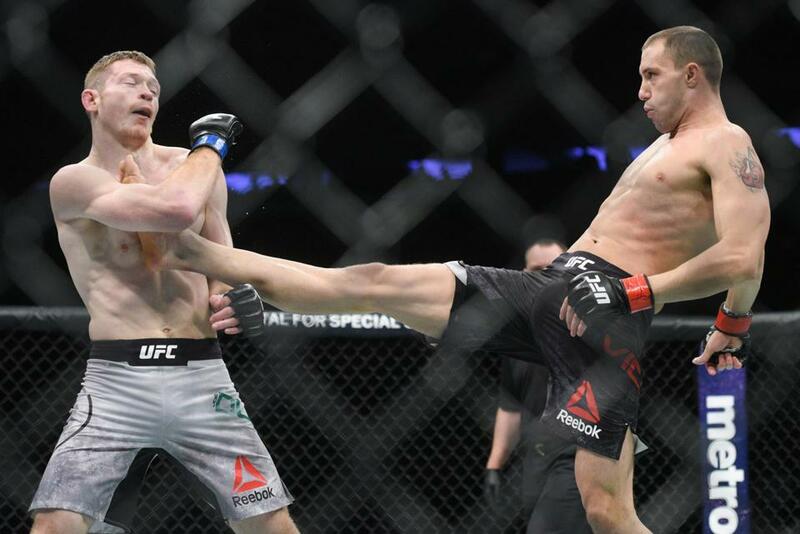 A battle between two underrated and somehow unranked lightweights culminated in James Vick knocking Joseph Duffy out late in the second round. Vick is now 8-1 in the UFC, and the matchmakers have to give this guy a top-10 opponent for his next outing. He’s clearly one of the best lightweights in the sport and should be fighting the best. A strange situation occurred in the second round of this heavyweight bout, as Walt Harris kneed Mark Godbeer in the groin and then kicked him in the head after the referee called time. Harris claims he didn’t hear the referee, but it’s hard to believe him after watching the replay. It’s possible the UFC runs this one back. After two close rounds which he likely lost, Ovince Saint-Preux knew he needed to finish Corey Anderson in the third round and did just that, landing a vicious high kick that knocked Anderson cold. OSP now has three straight finishes, and in the shallow 205 division he could be getting close to a title shot against champion Daniel Cormier. Randy Brown broke Mickey Gall’s undefeated streak with an impressive decision victory. Brown’s wrestling and pace proved to be too much for Gall, who will take a major step backwards with the loss. It was looking for a while like Gall might have some promise at 170, but Brown stole all of his hype with this victory. 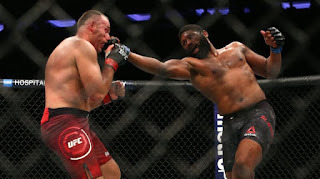 One of the most controversial moments of the night came as Curtis Blaydes defeated Oleksiy Oliynyk via second-round TKO due to a doctor stoppage. The fight was stopped after Blaydes kicked Oliynyk in the ear, which is an illegal blow, but after consulting replay the referee decided a TKO win for Blaydes and not a DQ loss or a No Contest was the right call. Although Blaydes was well on his way to winning the fight, the way it ended was very weird. The opening fight of the night featured one of the most brutal finishes of the year as Ricardo Ramos KO’d Aiemann Zahabi with a third-round spinning back elbow. You don’t see these type of KOs very often, and the fact that Ramos was able to land it and finish a close fight before it hit the judges’ scorecards is ultra impressive. Look for the UFC to fast track Ramos, who is only 22, up the bantamweight ladder, while Zahabi takes a major step back. UFC 217 was one of the very best cards in a very long time and was littered with talking points. Many of the storylines emerging from the card will fly under the radar because of the three title fights, but just keep in mind how deep this card was and how many divisions it will affect as we head into the final stretch run of 2017.